This section describes settings and additional configuration panels offered by the UI client. JEB ships with a default (clear) theme and a Dark theme. Toggle from default to Dark, and vice-versa, via the Edit, Theme command (or the Ctrl+Shift+Alt+T keyboard shortcut). The Edit menu (or the Application menu on Mac) allows users to customize the styles of interactive item as well as the code font used by most JEB views. Make sure to select a fixed font. JEB tries its best to select the most appropriate font on your system; if that fails, and you wish to select a font manually, we recommend Consolas on Windows, Menlo/Monaco on Mac, or DejaVu Sans Mono on Linux. Unicode: JEB supports Unicode. While the aforementioned fonts have good support for a variery of common non-ASCII planes (CJK, Russian, etc. 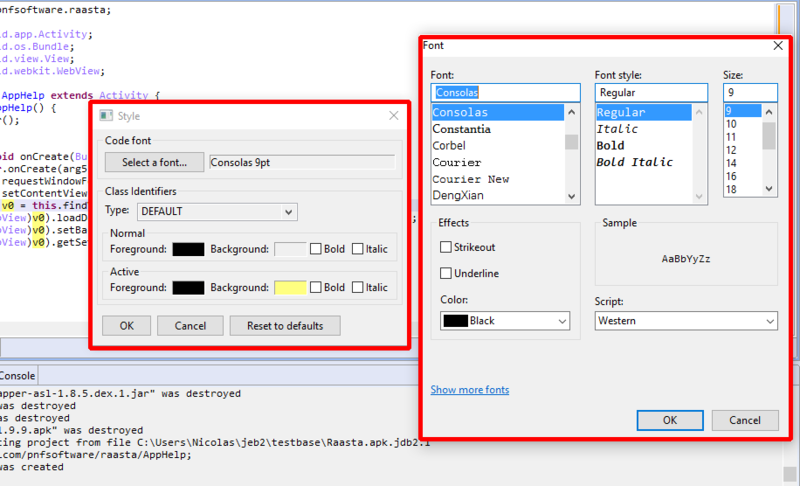 ), you might need to use a different fonts to properly examine strings written in exotic locales. Most JEB handlers can be triggered by keyboard shortcuts. The default shortcuts are visible when visualizing menu items. 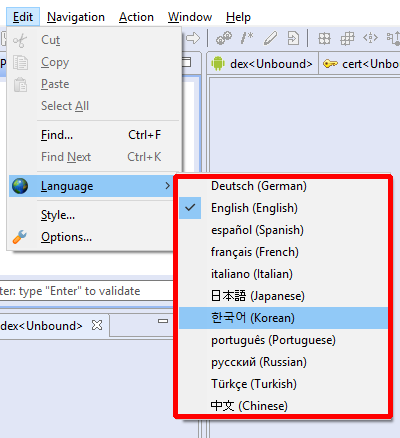 Note: the back-end components (modules and plugins) are not localized at the moment. Localization is for front-end components only. Simple options are accessible via the Edit or Application menu. 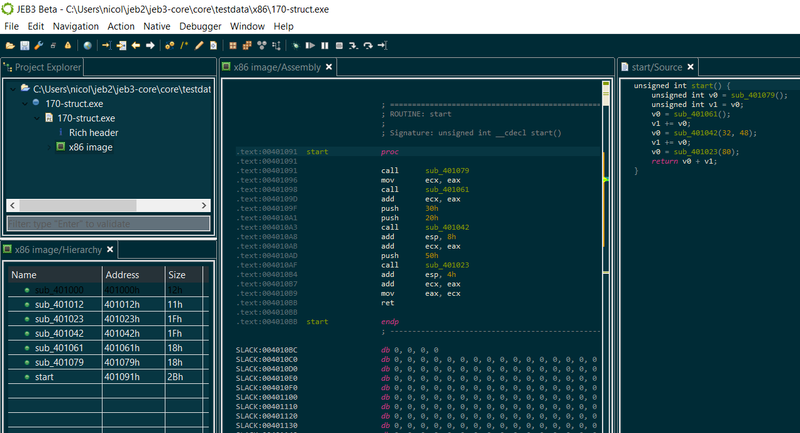 Two panels, General and Development, offer a partial view of JEB's configuration files, described in upcoming sections. Set-up your packaged plugins directory. 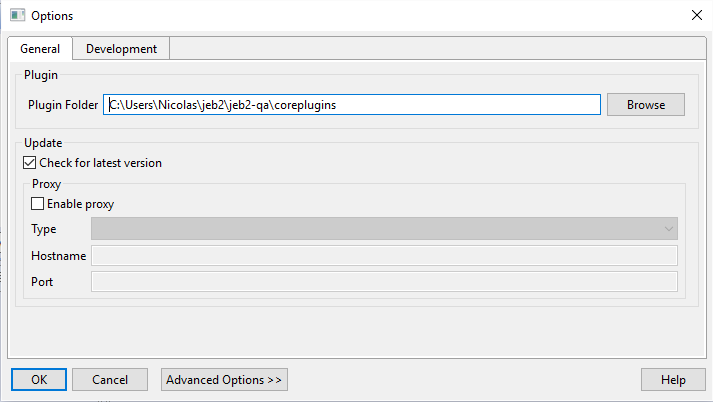 Packaged plugins are third-party Jar modules that add functionality to JEB: they can be parsers, disassemblers, decompilers, debuggers, code analyzers, etc. Third-party plugins can be loaded on Pro builds only. Customize your auto-update options. Proxy (http and socks) are supported. The Development mode enables verbose logging for increased insight into the program. 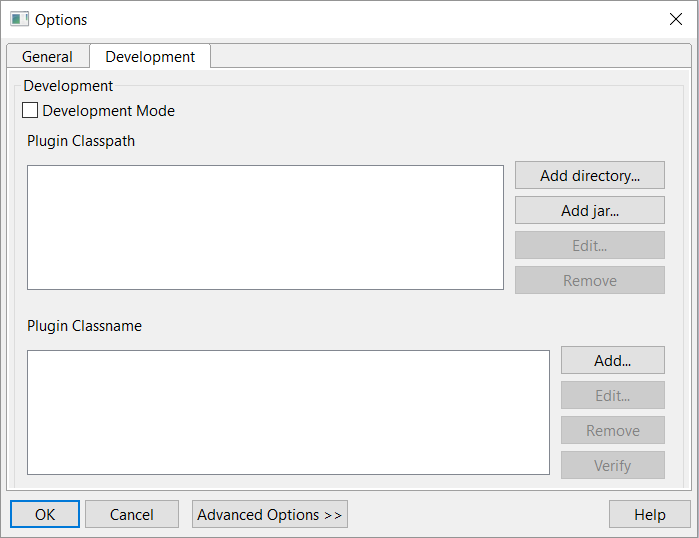 The plugin classpath and classname widgets allow setting up non-packaged Java plugins, which makes developing them easier.